If you are like most people, you probably like to spend time outside when the weather is nice. Unfortunately, you probably also know that a pleasant evening on the porch can be ruined by a swarm of mosquitoes. These insects can attack without warning, biting humans and pets alike. These bites can be painful, unsightly and itchy. In addition, it is possible for diseases to be spread to both humans and animals through a mosquito bite. While many people seek to avoid mosquitoes because of their unpleasant bite, in some cases, the itch and irritation of a sting may be the least of your worries. Both children and adults can develop more severe reactions including low-grade fevers, hives, and infections. Mosquitoes can also spread serious diseases including malaria, Blue Nile virus and Zika. Pets are also vulnerable to mosquito bites. Not only can they make your pet uncomfortable, but repeated scratching by your pet can result in broken skin and a subsequent infection. Dogs are also susceptible to heartworm transmitted by mosquito bites. You probably already know how to take some common sense steps for avoiding mosquito bites. Making sure that the screens on your doors and windows will keep mosquitoes out of the home. Bug repellent sprays can be useful when outdoors, and many flea and tick collars and treatments can also help keep mosquitoes off your pets. These actions can help keep mosquitoes off you and your family. However, there is more that you can do to keep mosquitoes away from your property. Mosquitoes are attracted to standing water. If you have a swimming pool, keep it covered. Regularly empty flowerpots, basins, children's toys or garbage bins of any accumulated water. If you have an ornamental pond in your yard, stock it with fish. Fish will eat mosquito eggs and larvae. 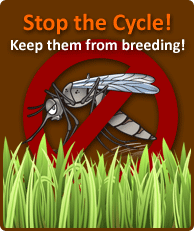 Another thing to consider is an effective mosquito treatment for yard use. One option is to make use of pesticides. Another option is a mosquito larvae trap such as My Mosquito Deleter. Traps attract mosquitoes which then lay their eggs in the trap. The larvae die off, preventing further infestation of your yard. This has the advantage of allowing you to avoid having to pay for an exterminator and having potentially toxic chemicals sprayed around your home.